Roundtable Contributors: Elizabeth Caran (Outlander Travel), Princess Fee (DF’82), Estelle Hallick (This Happy Place), Eric Hoffman (Netmongrel), Alan Mize, Melissa Sue Sorrells Galley (Mouse on the Mind), Blake Taylor (BlakeOnline.com), Andrew (Disney Hipsters Blog), and yours truly. Dragon Dice Master and Disney Parks Blog writer Gary Buchanan is nuts for dragons. This week, he returned to share a grainy film he discovered on the internet – a video he believes to be of flying dragons. Dedicated to getting down to the bottom of this strange and mysterious video, Gary is sure that the noises and strange happenings attributed to this video are somehow related to New Fantasyland (thanks hashtags!) and even created a Tumblr account where we can follow his findings. This isn’t the first time these dragons have made their mark in the Disney community. Back in the summer, leaked photos of a strange flying contraption in California led speculators to believe “this attraction” would be part of the Avatar-inspired land in Animal Kingdom. I have less of an opinion on dragons (sorry Gary) than I do on Disney’s improved use of social media. (Even if it is slow going.) I love that they are tapping into other outlets (Tumblr, YouTube videos, etc.) to engage their fans and spread the news of upcoming happenings. It’s almost like we can all discover it together. I know one thing... I can't wait to see more of Gary's dragon memorabilia. This weekend past, Walt Disney World was host to the annual Children’s Miracle Network Hospitals Classic. Played over the 36-holes of the Magnolia and Palm Golf Courses, the tournament is the final stop on the PGA Tour for the year. The final round, as always, is held on the Magnolia Golf course, which is the longest of the several Disney golf courses. This year’s winner was Charlie Beljan of the USA, who won by 2 strokes on 16 under par. Not only was this a magical win for Beljan in the fact it moves him up a number of places on the PGA Money List, but it was a sort of miracle. After the second round on Friday, Beljan was rushed to hospital after suffering from chest pains and spiking blood pressure. He also had paramedics follow him on the final 9 holes. This is the final year that the tournament in Walt Disney World will be sponsored by the Children’s Miracle Network Hospitals. Previous sponsors have been FUNAI, National Car Rental and Oldsmobile. With all the hoopla surrounding the 'kind of open, but not really open' Be Our Guest restaurant, something pretty interesting has rolled out. This restaurant will be the first location to carry the "Mickey Check" menu items. 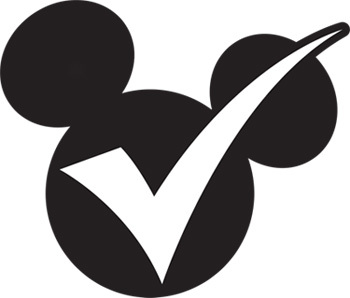 Part of the Disney Healthy Living program, the Mickey Checked items will have an emphasis on food more nutrient dense than your average theme park fare. Whole grains, and lean protein are both components here...which doesn't say much. The Disney Parks Christmas Day Parade will film its Walt Disney World segments on Friday, November 30 and Saturday, December 1 (going into Sunday, December 2 in the event of inclement weather) at the Magic Kingdom. The taping will include celebrity performances on the Castle Forecourt Stage, as well as the actual parade making its way down Main Street. 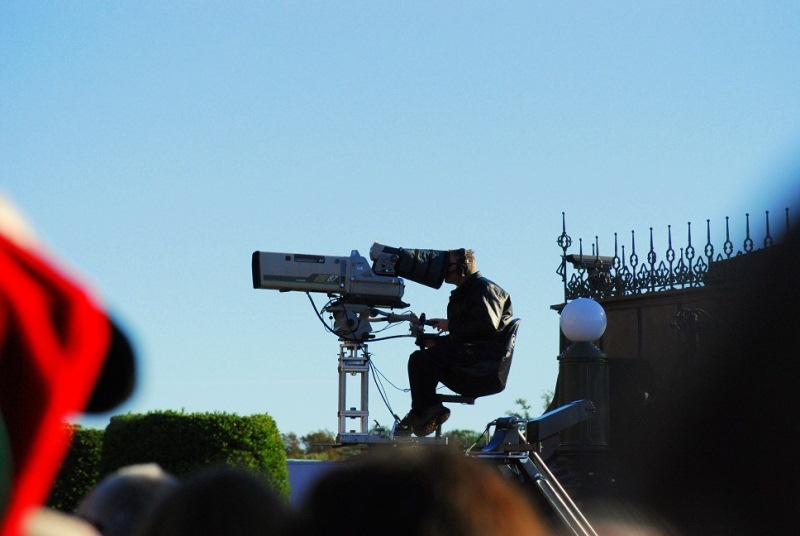 The Disneyland portions of the broadcast were already filmed, and everything will air on ABC on Christmas morning. Guest participation is allowed and even encouraged, as ABC obviously wants an energetic and enthusiastic audience to depict onscreen. While “tickets” are only available to Cast Members, you needn’t worry about any special system to attend the taping. You merely show up at the Magic Kingdom at opening time on the day(s) of the filming and join the rest of the crowd if there’s room (which there most likely will be). That being said, it’s certainly not for everyone. There’s a lot of stopping and going and standing around, which is a letdown to those thinking they’ll see a show run all the way through as it appears to be on TV. As someone interested in film and media as a potential career, I thoroughly enjoyed attending the taping in 2010. For me, it was really neat to see what goes on behind the cameras. I would advise, though, to not attempt to predict the production schedule or talent, even based on what’s been done in the past (not that I speak from experience or anything… ). If TV production fascinates you and you come prepared with patience, you’ll have a lot of fun (and might even be on TV!). I'm not a huge merch fan. After a 40-year relationship with the parks, I usually spend a lot more time than money perusing the shops for something new, unique, and special enough for me to purchase. But it seems that perhaps my aloof attitude toward the gifts shops just got a little peppy burst of energy. Why is that, you ask? BEHOLD, THE MERCHANDISE-INATOR! That's right. Disney is finally releasing a plethora of fun Phineas and Ferb stuff that I absolutely want to fill my shopping bags with. Last week, the latest addition to the P&F line of swag was announced on the Disney Parks Blog, and I am in love. The new "Best Day Ever" t-shirts feature all the beloved characters cavorting around the parks and dropping their most famous catch-phrases. Phineas, Ferb, and Candace are "so busted" when they get locked in the jail at Pirates of the Caribbean and Perry--not the infamous dog--holds the keys to their freedom). Another t-shirt features Phineas at the helm on the Jungle Cruise while the t-shirt begs the question: "Aren't you a little young to be a skipper?" But my favorite, by far, is Professor Doofenschmirtz standing outside one of the service elevators at the Twilight Zone Tower of Terror and exclaiming, "BEHOLD, the ELEVATOR-INATOR!" Yeah, Ferb, I know what purchase I'm going to make today. With Disney California Adventure's Starbucks doing swift business, Disney has finally announced two of the new Starbucks locations in Walt Disney World. One will take over the Main Street Bakery in Magic Kingdom, while a second will find a home in Fountain View in Epcot. There has been a lot of griping about the "death" of Main Street Bakery, but I couldn't be happier! Until now, I've had to leave the Park to get a decent cup of coffee (The Wave and the Kona Coffee Bar come to mind)—this new coffee bar will help me keep swimming all day. Starbucks will also serve some of their delicious signature breakfast sandwiches in addition to frothy coffee beverages, and I am looking forward to having some more options on Main Street. (I've eaten one too many ham, egg and cheese croissants.) For those of you worried: your favorite cinnamon buns will still be available at Gaston's Tavern, and Sleepy Hallow Refreshments will be dishing up homemade ice cream cookie sandwiches. On November 9th, Disney announced that the venerable Main Street Bakery on Main Street USA will in fact be one of the locations for Starbucks coffee signaling an intent to keep this WDW landmark open for the foreseeable future. Earlier in the year, Disney announced that they planned to roll out 6 locations for the Seattle, Washington based purveyor of popular java drinks within Disney properties in Florida and California. With the confirmation of Main Street Bakery as one of the Florida locations, WDW regulars with a sweet tooth can now enjoy those sweet treats with a rich, flavorful cup of real coffee. The near-ubiquitous Nescafè brew that was sold there in the past was not what any Javaphile would consider an acceptable cup of coffee. As for what the new menu at the MSB will look like, that is an entirely different question. The bakery will close for refurbishment in January 2013 and reopen in the summer with the full selection of Starbucks eats. Disney generically states in a story on the Disney Parks Blog that a selection of Disney favorites will also be available. Last week, I told you about my favorite Walt Disney World Christmas event, The Osborne Family Spectacle of Dancing Lights at Hollywood Studios. This week, Disney began construction on another Walt Disney World Christmas tradition, the often-overlooked gingerbread displays. These aren’t your basic run of the mill gingerbread kits that you can find at your local supermarket. These are life size creations that take hundreds of man-hours to build and can be found all over The World. While most of these gingerbread creations are found inside resorts, there is usually one located inside The American Adventure pavilion at Epcot, which sells Egg Nog, and other holiday treats. In addition, you can find other gingerbread creations at the Yacht and Beach Club Resort and the Contemporary Resort. In the past, the WDW Food Services cast members have built Christmas trees, gazebos, and carousels just to name a few of their creations. 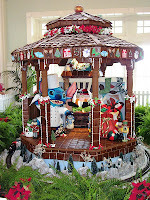 The highlight of the year is the gingerbread house in the lobby of the Grand Floridian Resort. Over the next week, over 10,000 pieces of gingerbread will be used to build a 16-foot tall gingerbread house. Once complete, the house will be used as an actual kitchen where they will bake and sell various gingerbread snacks for you to enjoy. 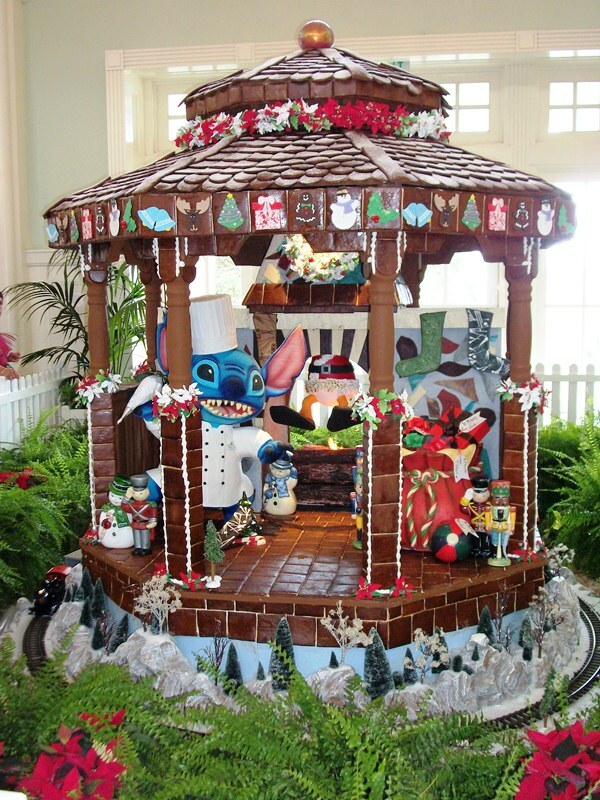 This is the 14th year for the Grand Floridian gingerbread house and it is a truly amazing thing to see in person. If you’re planning on being at Walt Disney World during the Christmas season, take the time to stop by the Grand Floridian or the other resorts to see these magnificent creations. I know that most people try to spend as much time in the parks as possible, and I can understand that desire, but this is one time where you really should stop and smell the roses…or the gingerbread. You’ll be glad that you did. Okay, the Epcot International Food & Wine Festival has come to a close. The festival center has been shuttered, the kiosks will slowly begin to make their way back to their home on the access road behind Epcot, and the bunting and banners will soon be replaced with garland. So, as Epcot transitions to the winter months, I should be getting psyched about Holidays Around the World, right? Wrong. Now is the perfect time to get those bulbs in the ground and preparation of a gorgeous spring! That’s right, I’m pumped because now I can begin prepping for my favorite festival of the year, The Epcot International Flower & Garden Festival, the dates of which have just been announced. Running from March 6 to May 19, the 2013 installment will be a celebration of festival’s 20th anniversary. The gang will all be there in celebratory topiary fashion, along with an display tied to Monsters University and a Cars play area near the newly redesigned Test Track. I don’t know if it is the fact that I grew up with all types of gardens around my home or if it is because I don’t have space to speak of to create my own gardens in my current residence, or it could simply be that Walt Disney World instilled in me a love of topiaries at a very young age, whatever the reasoning I love the Flower and Garden Festival above all other events and festivals Walt Disney World puts on throughout the year. From the demonstrations, the Do-It-Yourself guides, and the amazing work from Disney Horticulture, I have gathered a lot of materials and ideas over the years, which will make for one stellar looking yard once I have one! Oh, and did I mention that Micky Dolenz, Herman’s Hermits, and Chubby Checker are all slated to croon for the crowds and flowers?!? !